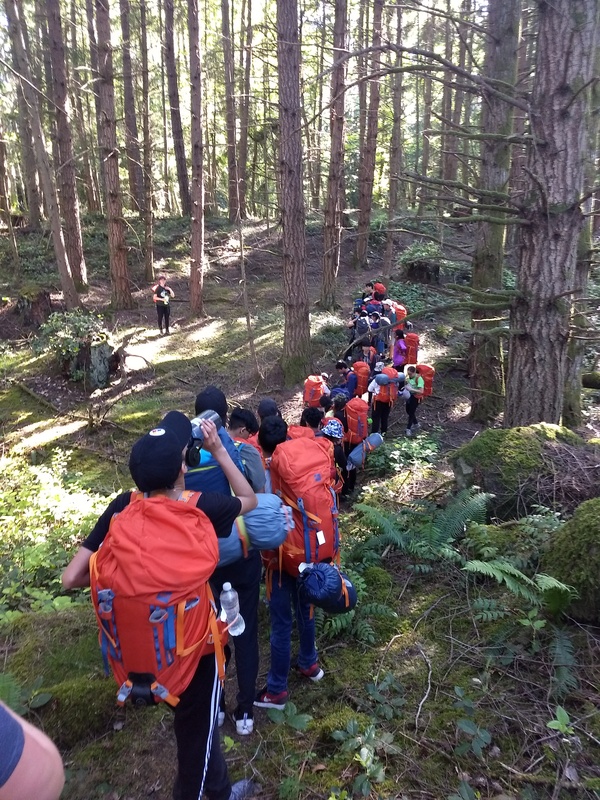 Cambie Secondary School students ventured boldly forward into the lush Galiano wilderness for a 3 day and 2 night Back Country Experience. These keen explorers—the majority of whom were completely new to backpacking—were introduced to the basics of navigation, bush-camp life & wilderness safety. 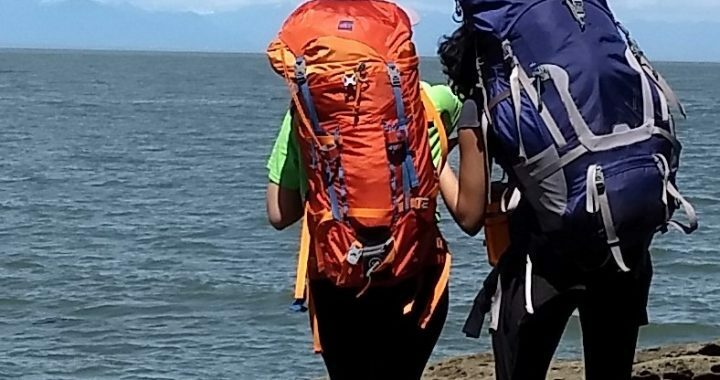 Upon their arrival from Richmond, BC the students mastered the tricky task of properly loading a backpacking pack. Groups collaborated to distribute weight evenly among them, divvying up items from food and fuel to tents and toilet paper. Straps strapped, buckles buckled & zippers zipped Cambie Secondary set out with their loaded packs for a 7km journey along the Vanilla Leaf/ Pebble Beach Reserve trail networks. Along the way students learned how to read topography maps and identify different plant community structures, and relaxed at Pebble Beach for a well-deserved break. Rest stop a steep climb up the ridge to observe the mature forest! 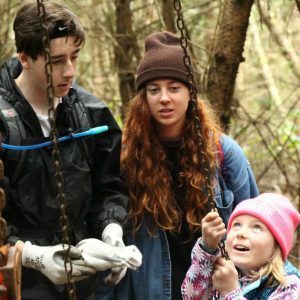 Students cheered as they approached their campsite at the Millard Learning Centre having completed their grand hike from ocean to ridge plateau. As the sun began to set, students settled into their new camp home for the next two nights. The smell of dinner wafted on the air as groups fired up their lightweight gas stoves. With bellies full and tents pitched it was time for some well deserved sleep under the stars. Day 2 – Orienteering, Shelter Building & Invertebrate Surveys. Day 2 started off with laughter as groups competed in a knot-tying & tarp shelter-building challenge. After securing a rope with bowline and trucker’s hitch knots , students scrambled to erect an A-frame shelter to shelter from the elements. 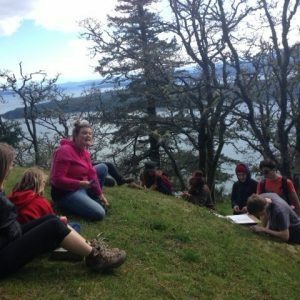 These youth of the concrete jungle hiked through the Coastal Douglas Fir “jungle” while participating in a fun team-based orienteering activity. With their newly acquired compass knowledge, teams took a series of bearings and conducted measurements which lead them closer and closer to the secret hidden treasure at the end of the orienteering course. The day finished off with an fruitful investigation of invertebrates from marine and freshwater environments. Students equipped with nets and magnifying glasses studied the intricate and strange anatomy of carnivorous insect larva, freshwater salamanders & tadpoles at the Learning Centre’s pond. 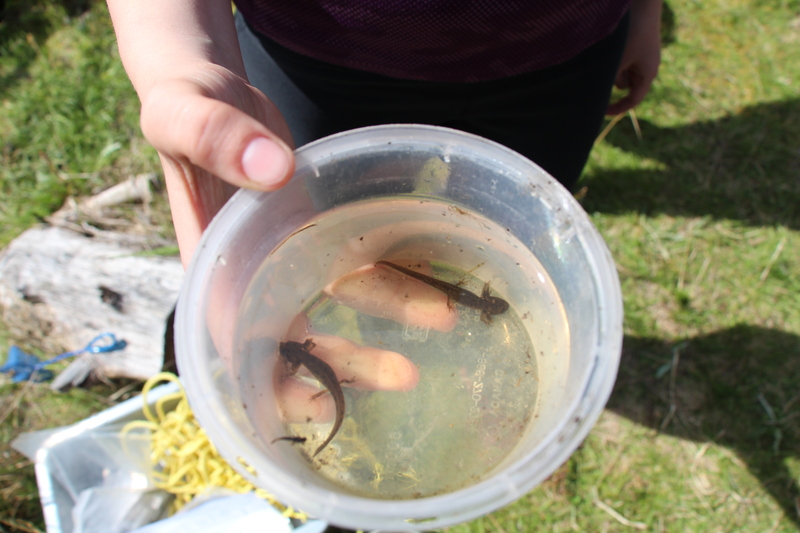 Young salamanders found at the Learning Centre’s pond! On their final day campers learned about what to do in an emergency during a comprehensive wilderness first-aid lesson. In role-played scenarios rescuers determined how to assess and attend to common hiking injuries such as sprains, strains & cuts. Students also investigated the uses for all the materials found in a standard first aid kit. After lunch, students learned about native plants, their edibility, medicinal properties & first nations usages during a teaching train. They also had opportunity to harvest, brew & taste fir-tip tea—a Vitamin C-rich, lemony beverage. 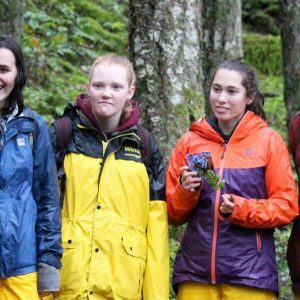 After a whirlwind of three days, Cambie Secondary may have departed Galiano a little wilder, but they were certainly less green in their backpacking and camping experience. Thank you for your visit and we hope to see you again soon! Posted in Program Spotlight and tagged adventure, back country, backpacking, experiential education, hiking. Emily earned a BSc. 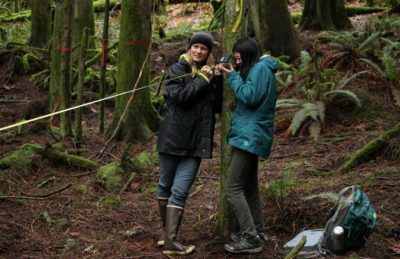 in Environmental Science from Royal Roads University. 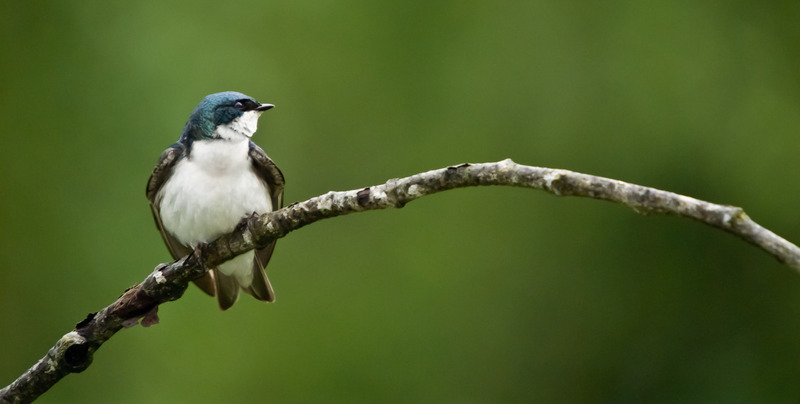 Emily has worked with a diversity of environmental entities in the clean technology industry, in social-environmental non-profits and in academic communities. 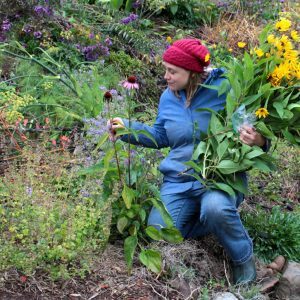 As a scientist and artist she combines her technical knowledge and creative approach to teach about unique pacific-northwest ecosystems and to explore the complex relationships between people and the environment.